Just wanted to post up my results. I have an 8918-CTO R61 15.4" Widescreen, Penryn T9300, OCZ Octane 120GB SATA III SSD. My requirement was that this would allow for SATA II speeds. I wasn't concerned with anything else at this time, like swapping Function key, etc. Since I'm running Windows 7 Pro 64-bit, I had to boot off USB (or CD, though I preferred USB). 2) Copied over my bios download, version 1.29 for my laptop, and used ISO #1. Extracted the files via Winrar and copyied directly onto the USB drive. 3) Changed my boot priority in BIOS to load the USB drive first. 4) Booted to the DOS prompt. 6) Waited for this process to finish, followed by a long beep, and a reboot. 7) Removed the USB stick and the computer started right up. This looks like my baby but there are 3 ISO files in here and I am a little confused in which order to try these? There are are two in a folder called "BIOS update + CTRL-FN swap" and a third in a "Bios Update" folder. I am running Win 7 64 Bit so have to go the ISO route.. Also, don't have a CD so really hoping I can burn to a stick?? Just came here to thank you so much for your effort!! First, thanks to middleton for spending his time helping other people. Compared to the leomas x61s, it appears not to be a good reading result. Unfortunatelly, I haven't benchmarked before I applied the new BIOS, because I installed the SSD only after I've already flashed the middleton's BIOS. 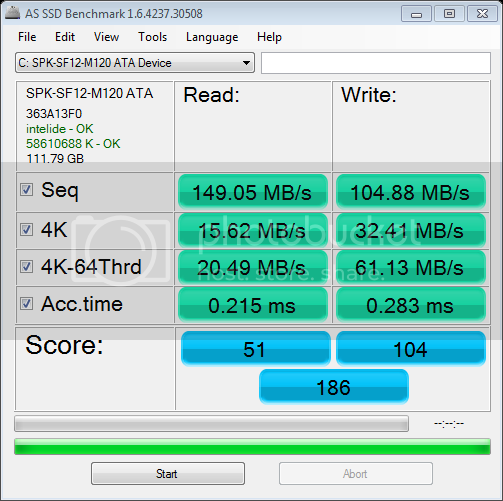 Furthermore, my SSD is not one of the great ones... its s Kingspec 120GB. Maybe this is the reason because I didn't get excelent results. How can I check if Sata 2 is active/working? Thanks again for middleton and everyone who contributed to make it possible. Any love here gang?? I desperately need to squeeze more speed out of my X61 but don't know which of the 3 ISO files to use in the archive for my model. I desperately need to squeeze more speed out of my X61 but don't know which of the 3 ISO files to use in the archive for my model. Have you bothered to read and understand the accompanying "READ_ME!! !.txt" file? It's content is not too hard to understand and should easily answer your question. I don't have any special BIOS modding style. I make mods with tools from forums.mydigitallife.info. If you need a modified BIOS, then leave your request there. Whitelist and SLIC 2.1 are not a problem for those guys a long time ago. As for dual-IDA support: give them link to kizwan's "EIST Unlocked Example" guide. It would be great if you could post a How To / kinda open source/ it so people can support you or supplement the work you have done and carry it forward, when you dont have time. Maybe, with or without your guidance/ supervision. I flashed bios in my T61 14" bios to ver. 2.29-1.08 (without CTRL-FN swap) with the cd image. I checked with ThrottleStop utility that dual-IDA works. Afetr replacing my T7300 with T8300 my T61 is not working. I press power button, HD is spinning but lcd is black. When I put old T7300 back everything is working. What's wrong? Is it possible that this new T8300 is dead? Has anybody tried this bios update with a QXGA 15.0" non-widescreen 4:3 ratio display. What I have is a T61p 8891-CTO (14.1" 4:3 motherboard) in a 15.0" thinkpad body. It has a Vertex 3 SSD drive. Any chance the Bios upgrade would impact the higher resolution 2048x1536 capability? DISCLAIMER: Use these modified bios at your own risk!! Lenovo have never tested or approved these patched bios and doesn't support them. They are provided "as is" without any warranties from Lenovo. These bios-es are completely unofficial releases. Note: CTRL-FN swap is optional. Each BIOS package contains two versions of the patch. You can select the version without CTRL-FN swap. nando4 for providing all needed information on SATA-II mod. I knew nothing about this issue in 2010 and didn't plan to make any ThinkPad BIOS mods (except for CTRL-FN swap). It was him who convinced me to solve SATA-II problem. Also he literally forced me to add dual-IDA support (he knows what I'm talking about ). Can I put this version of the bios? or I need another one adapted to 64bits?